Good morning everyone and happy Thursday! The clue words were duck soup for me this morning so I’ll take a pass at picking the most difficult one. Hopefully tomorrow’s puzzle will be a real challenge and I’ll pick two. Moving forward to the cartoon, it was an instant solve as well after the “great white shark” giveaway in the sentence. The cartoon was well drawn with my favorite detail being the light from the movie projector being cast over the audience. Jeff nailed the shading in such a way that the drawing actually felt animated. The 70’s vibe was definitely captured with the hairstyles and mustaches as well as the word disco on the shirt of the man in the front row. Is that a young Rob Reiner in the middle row to the far right? It sure looks like him to me. Have an out of sight Thursday and I’ll see you tomorrow! 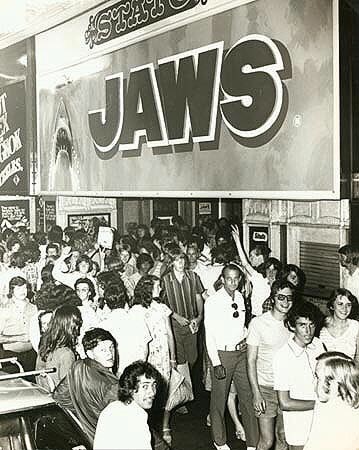 Up on the screen a flick called JAWS. Could this be real, could this exist? The rest of us nigh died from fright…. Nothing to it. A bowl of Coffee IC. Put the TEETH to it. The BANJO player appointed a PROXY to participate in his wedding in Nashville because he was on tour in Australia but he beat a SPEEDY retreat home when he discovered the WICKED fellow planned to steal not only the bride but the gifts as well! Easy solve today–used a site where they time how long it takes you and I was under 1 minute 20 seconds. Only observation about the cartoon was the clothes. The haircuts certainly reflect the time but do the clothes? But then I was out of the country all during the 70s so maybe I have the wrong impression. Angela–maybe I was thinking more of the 60s for the wild prints, blousy shirts, ruffles, psychedelic colors, etc.? Doesn’t matter, I was nit- picking instead of appreciating the cartoon. Question: The poem, you posted…..is that yours or are you quoting someone/something I am unaware of.? At any rate—BRILLIANT. I agree, Earl, I would have been expecting giant platform shoes and open shiny polyester shirts with chest hair (Ewww). An Earl sentence and an Angela poem – my day is off to a good start! Steve–I don’t mind answering since I brought it up in the first place!! I spent three years in Nigeria, 12 years in Sierra Leone and lesser amounts of time in the UK, Israel, Liberia and Cameroon. Much of the common cultural knowledge most Americans my age share, I am rather ignorant about—especially tv, movies, some music and just “stuff”—Walkman, the precursor to tapes,vcr’s and on and on. I’m still learning at my ripe old age. Thanks Earl! That’s really fun and interesting to hear about. And I thought I was adventurous moving a mere 3000 miles from home! Steve–but I did not really answer your question—sorry—No, my living abroad did not give me any experience about “proxy weddings” I just needed to use that word and I recall having heard about them somewhere, sometime. Maybe in a history course in university?? Good morning. Three words were an instant read but I had a mental block on number three. I then went to the cartoon and after looking at the letters I had, I was able to instantly get the answer. Knowing the letters I needed I was able to move to a speedy finish. It should have been the first lightening answer rather than sneaking in the back door for the solution. Oh well. A win is a win is a win thanks for the fond memories It would be interesting to know if it really was him. Like when everybody wanted to know who that sailor was that was on the front page of the news paper kissing the girl after the end of WW2. Until tomorrow stay well. Maybe Jeff will be kind enough to let us know, Paul. Great job on finishing the puzzle. You’re correct that a win is a win is a win. I’ll catch you tomorrow, my friend! Instant solve all around this morning. Seems the Mariners haven’t been left for dead quite yet! And in other news of previous Jumble puzzles..
And Re: the “Nothing” math cartoon: If our retired math prof is still lurking about, the BBC had a story about carbon dating the earliest known appearance of the zero. 🎵”Saved by Zero”🎵, and we were, unless you would have enjoyed balancing your checkbook with Roman Numerals all those years. Interesting! I haven’t heard that in a long time before now. How about “Frozen Rope”? 😂 Of course Eck is a hero to us here. Hi, all!! Because of such a SPEEDY solve about that WICKED shark, I had time to enjoy the excellent cartoon picture and think about the continuing impact that movie has on Jerry & me. When I find Jerry watching a rerun of any Jaws movie, I laugh at him, he laughs back, I ask him about a detail & ask if it has happened yet, and the next thing I know I am sitting there watching the thing with him. Yikes! One of the highlights of our visit to Universal Studios was when Jaws came up & out of the water toward the bus. I jumped higher than our children did, and I’m sure my jaw dropped. Mike, thanks for your timely & thoughtful reminder to ask for help when needed with heavy lifting. See you tomorrow, all. True story from Joe Thornton: He said that when he learned he was going to be traded from the Boston Bruins to the SJ Sharks, he went in to tell his father – and found him watching “Jaws”! Hi, Steve! I enjoyed your lively post, as usual, and your comments to me. My answer was waaaaay too long so I put it under your comment to me yesterday in IOW. Hi, Mike! Wonderful vacation memories! Nothin’ like ‘em!! Thanks for sharing. I liked your “duck soup.” I used to say something was as easy as duck soup. You’re a foodie. Is duck soup easy to make? You don’t have to answer that. I noticed how real the cartoon picture looked today, as though I were right there, but didn’t know why until I read your description of the movie projector light and Jeff’s excellent shading which made me go back to enjoy the picture some more.